Asbestos is a danger in many different sectors and it is estimated that 20 tradesmen, 4 plumbers, 6 electricians and 8 joiners die every week from this hidden killer. It is important to know when there may be a risk of exposure and how to avoid coming into contact with Asbestos. Asbestos was extensively used as a building material in the UK from the 1950s to the mid-1980s. It was used for a variety of purposes and was ideal for fireproofing and insulation. Any building built before 2000 can obtain asbestos and they can be homes, schools, offices or hospitals. Asbestos materials in good condition are safe unless asbestos fibres become airborne, which happens when materials are damaged. 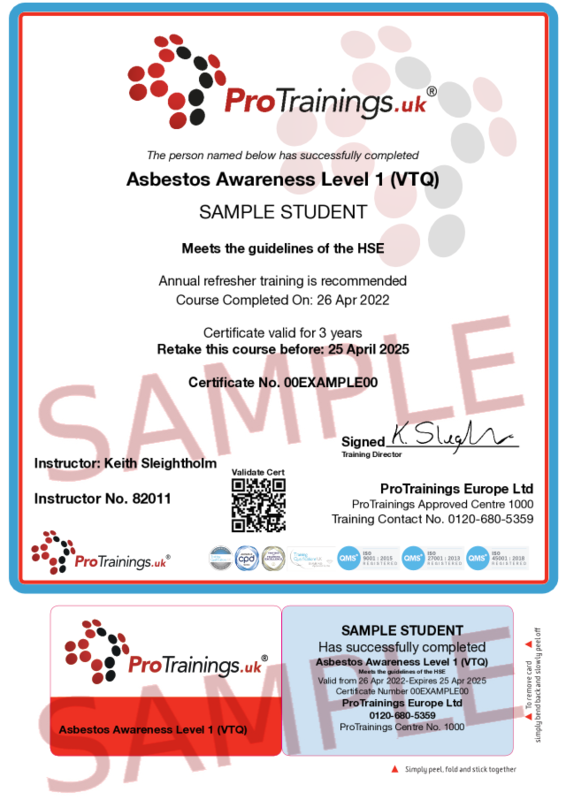 This course covers the risk, why we need to avoid exposure and what can happen with exposure or when you are exposed, as well as what to do if you come across possible Asbestos to ensure you and your work colleagues are kept safe. The certificate is valid for 3 years. 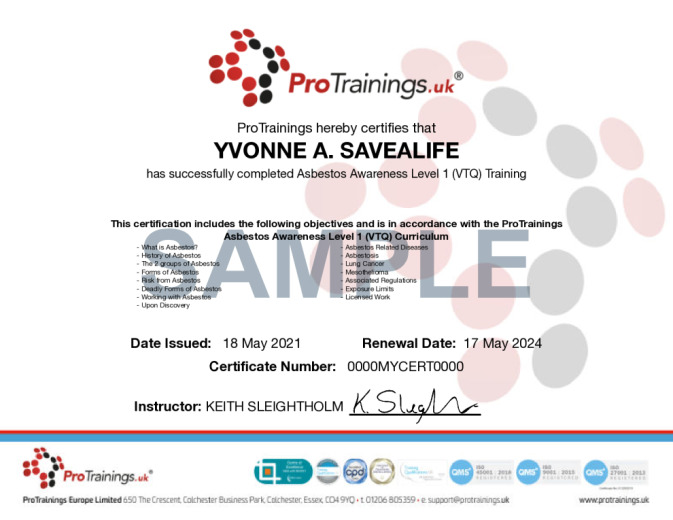 To comply with the HSE recommendations it is advised to complete a refresher every year. Cleaning or repairing asbestos cement sheet roofing or cladding. This course comes with 3.0 hrs (4.0 class) of CPD, although the time to complete the course online may be less than this. Total course time includes 1 hour and 32 minutes of video training as well as knowledge reviews, final test, remedial help and reviewing downloaded material. What do I do if I find Asbestos?